Can you guess where I was in August? 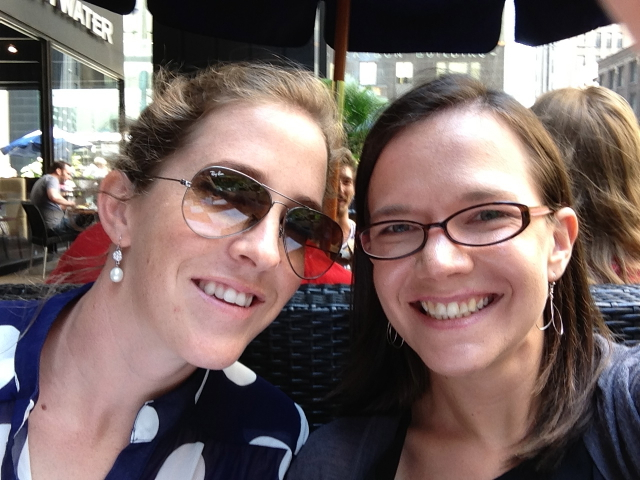 I spent a girls weekend in Chicago with few friends and my sister. It was a great weekend in a city that I love. It also happens to be a city with really good food. 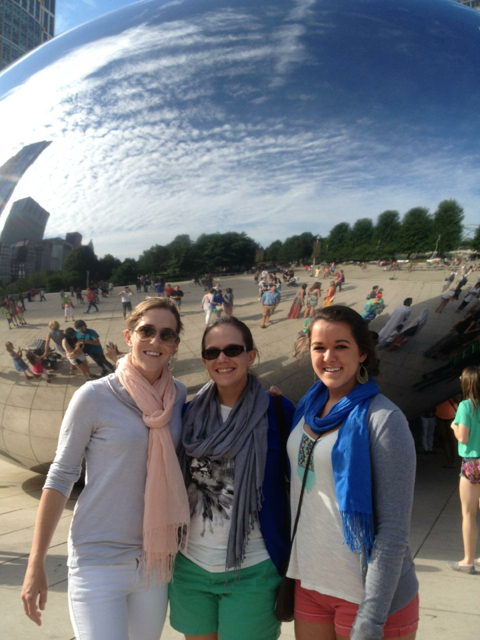 Ansley, me, and Jenna in front of Cloud Gate (aka The Bean). 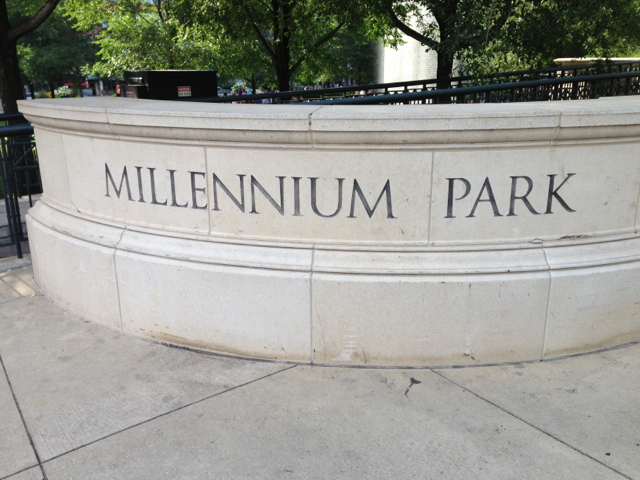 Chicago is known for their architecture. 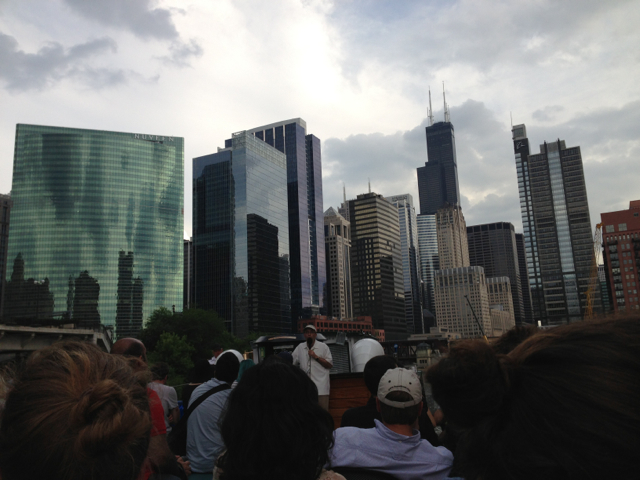 We took an architectural boat tour and learned all about the city’s fantastic buildings. Skyline from the north end of downtown. 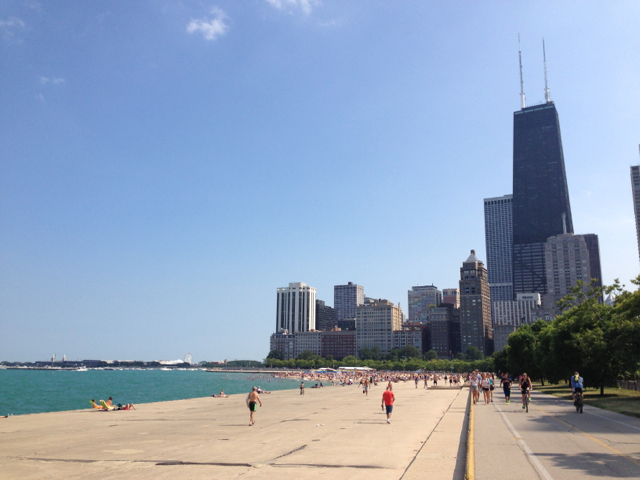 You can see one of the great lakes is right next to the city creating an interesting combination of urban city center and beach. 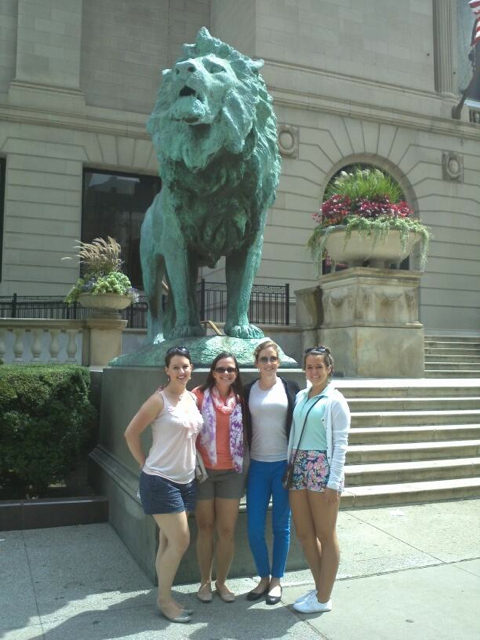 Allison, me, Ansley, and Jenna in front of the Art Institute. We also spent a morning at the Art Institute of Chicago. They had a great exhibit on impressionism and fashion. It was very interesting and really well done. 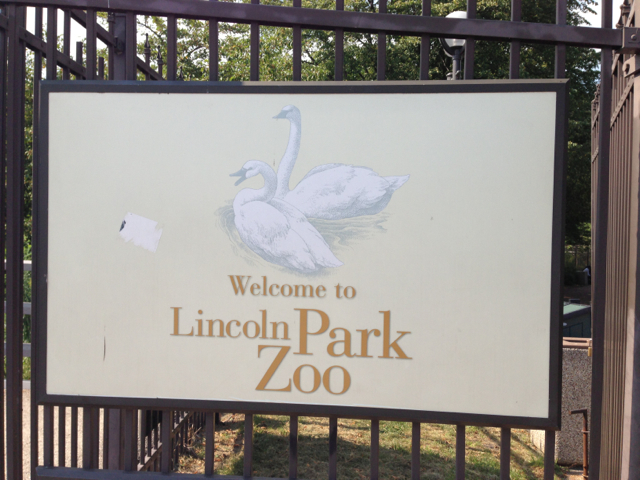 Jenna really wanted to see the zoo, so we walked (4 miles from our hotel!) to the zoo one afternoon. It was great (and free!) but most of a lot of the animals were asleep because it was the middle of the afternoon. 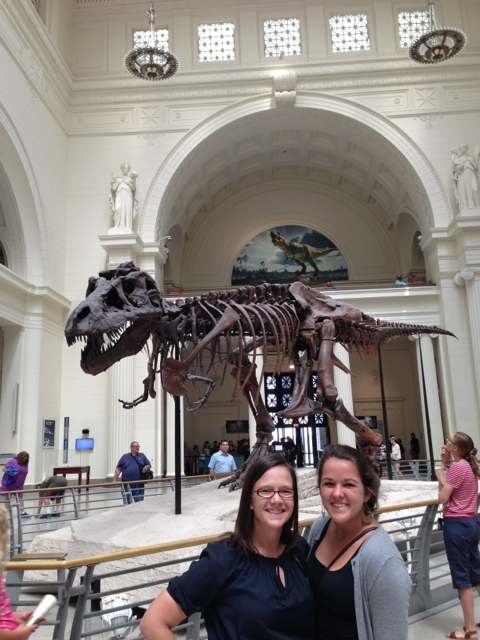 We went to the Field Museum (which was a total bust!). We did get a picture with Sue the t-rex though. Every day, we walked between 4 and 8 miles to get to sites and restaurants. This certainly led us to work up a big appetite and the food did not disappoint! My friend Julie lived in Chicago for grad school and sent us lots of delicious suggestions. Thanks, Julie! I didn’t actually take a lot of pictures of my meals (probably because I was too busy eating them!) but I snapped a few. 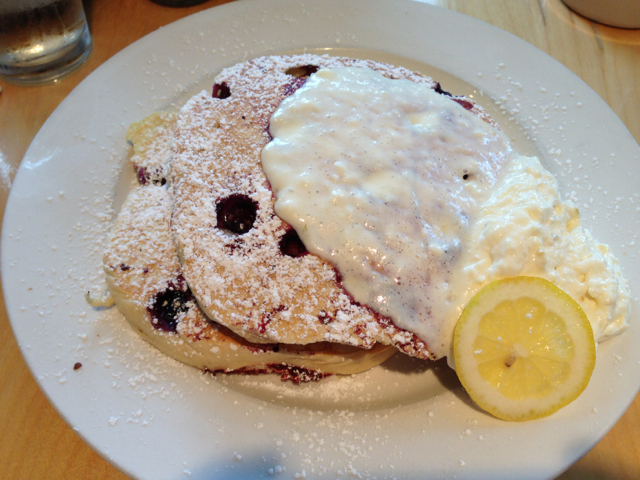 The best lemon blueberry ricotta pancakes ever at Bongos. 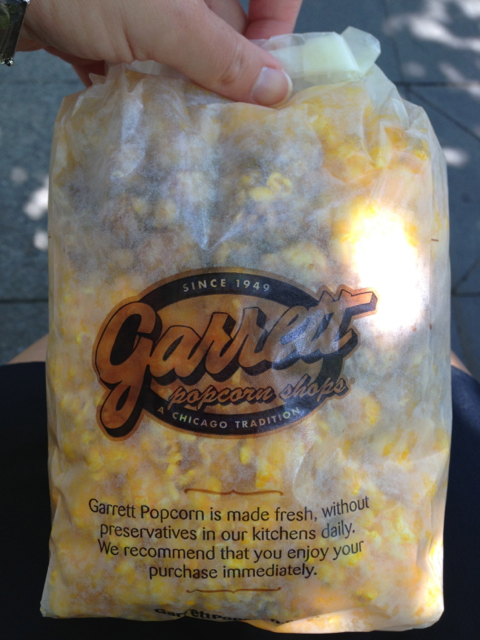 Garrett’s popcorn – cheese mixed with caramel for the perfect blend of sweet and salty. 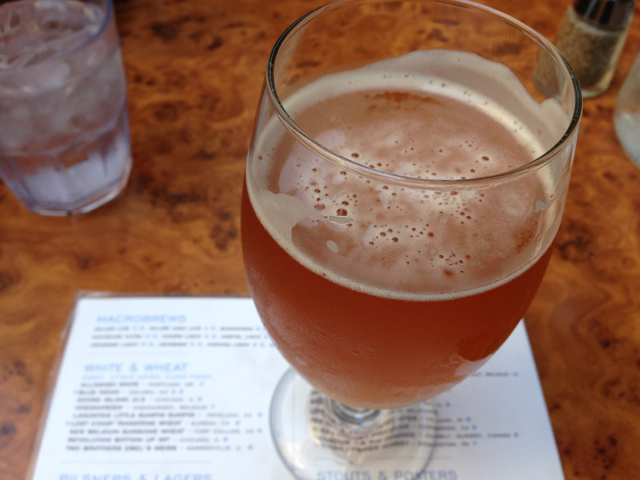 Lunch at Sweetwater Tavern – I was introduced to a good local brew and fried cheese curds. 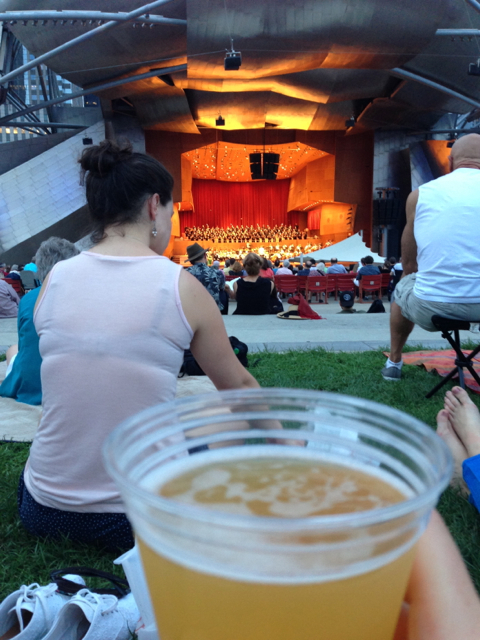 One evening we went to Millennium Park and had beer, bread, and cheese while we listened to a concert. 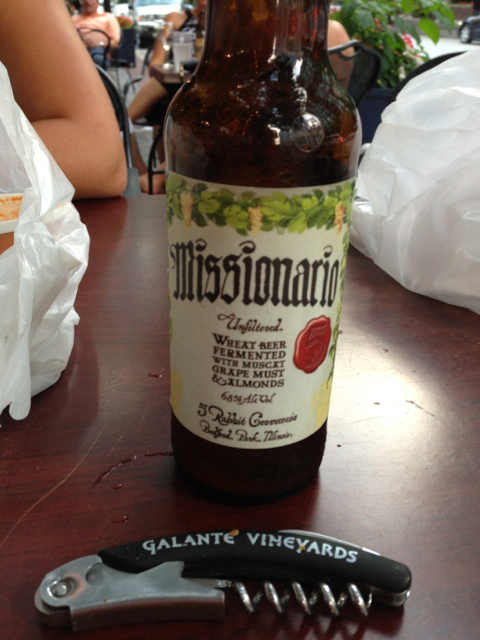 Yummy local brew and the beer opener I charmed off the beer and wine guy at Fox and Obel’s Food Market. 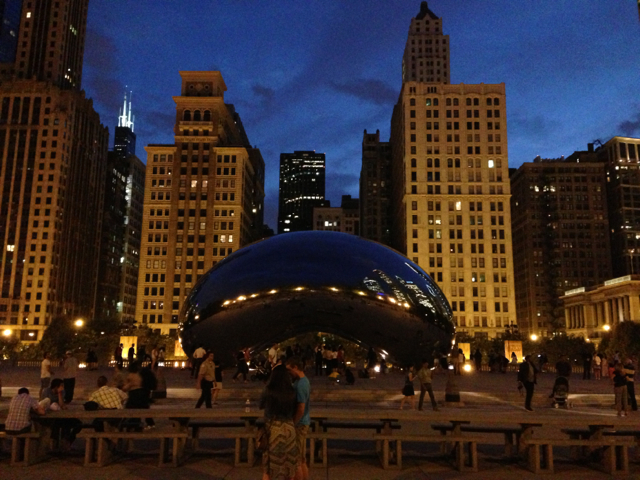 The Bean at night. Beautiful. Other places we ate included Cafecito (the best Cuban in Chicago), Lou Malnati’s (deep dish pizza with a delicious crust), and Waffles (green tea and red velvet and waffle breakfast sammies – oh my). 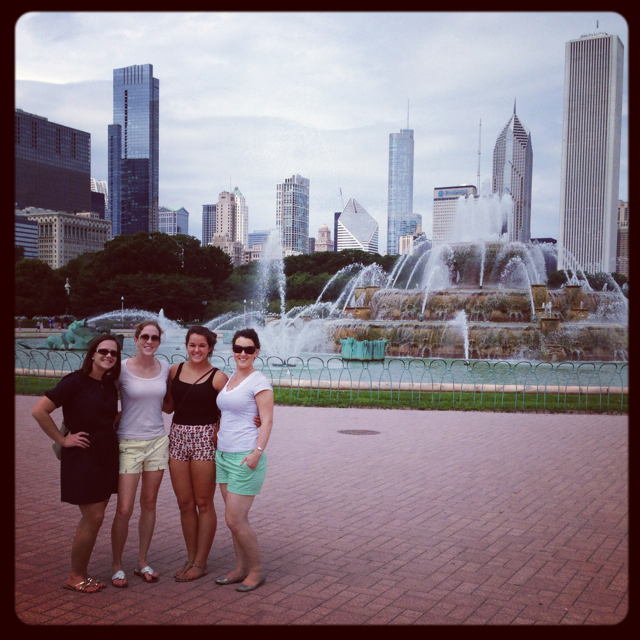 I love these girls and I love Chicago. 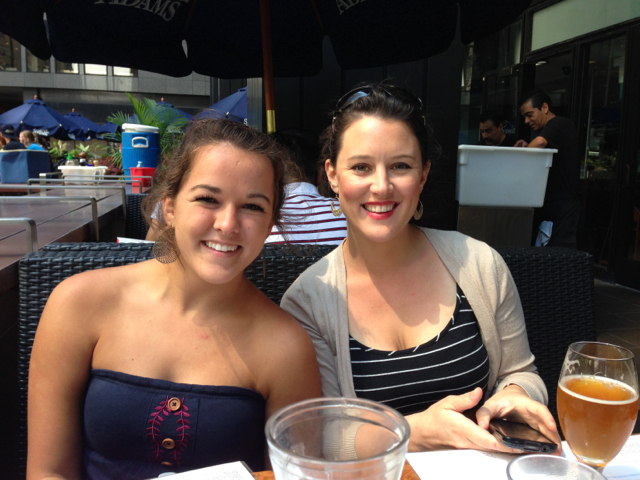 It was a great weekend and I look forward to many more fun and fantastic girls weekends (with great food!) shared with these ladies in the future. I love breakfast foods. I could them any time of day. I’m not picky – I like eggs, muffins, scones, cinnamon buns, biscuits (with or without gravy), grits, waffles, pancakes, fruit, and the occasional slice of bacon. And coffee. Let’s not forget coffee. Brunch is one of my favorite meals to host because the food is pretty low maintenance to prepare, the food can easily be scaled to feed a crowd, and a lazy Saturday or Sunday morning is the perfect time to hang out with family and friends over a leisurely meal. 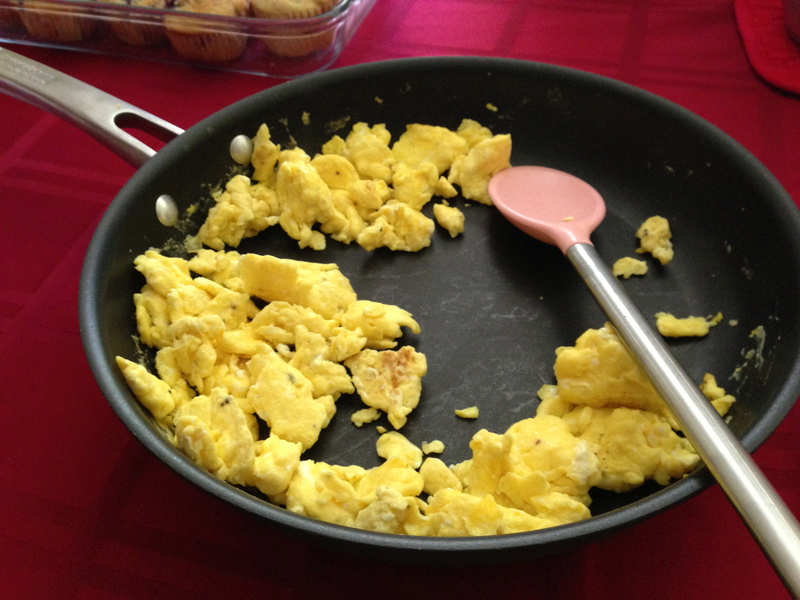 Earlier this year, I wrote about our family brunch. On the menu in the photo below, we had biscuits and gravy (pork sausage gravy in the big pot, turkey sausage gravy in the small pot), scrambled eggs, yogurt almonds, fresh fruit (raspberries, nectaries, and grapes), and blueberry muffins. And coffee. Let’s not forget coffee. 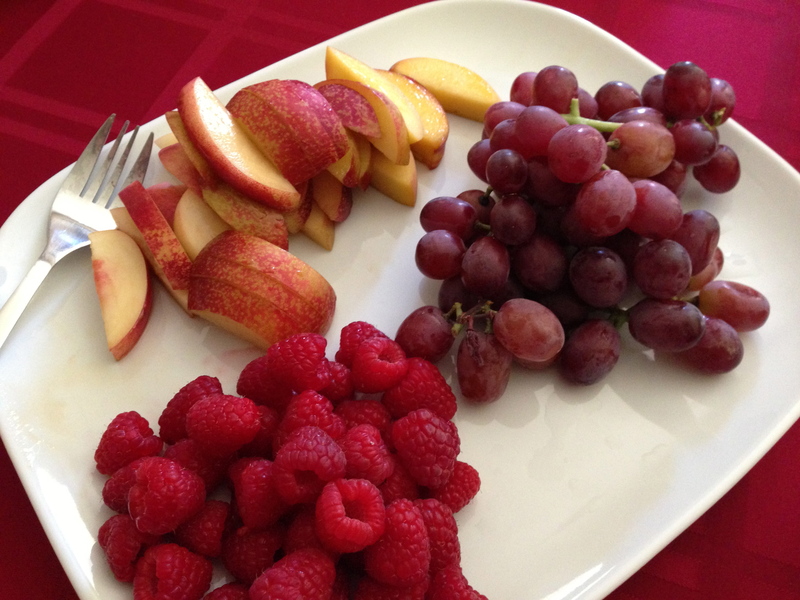 What are some of your favorite brunch foods? 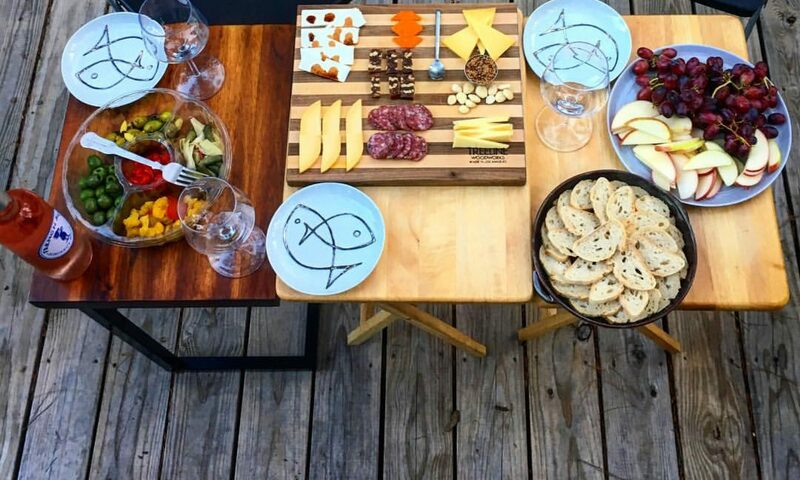 I’m looking forward to planning some fun brunch gatherings in the future with good friends and yummy food. And coffee. Let’s not forget coffee. 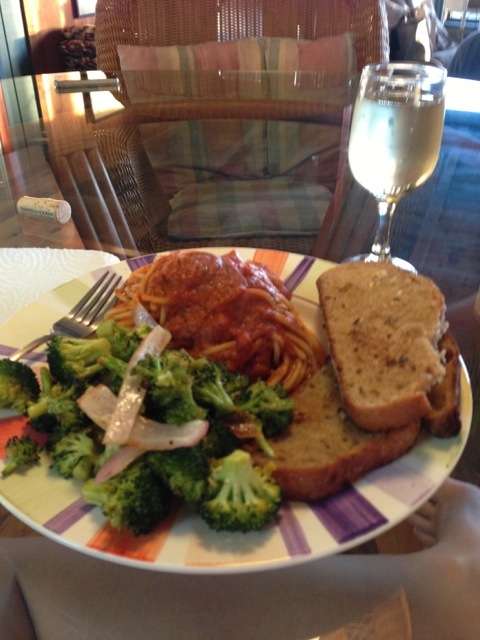 While we were on vacation, one of our meals was spaghetti with roasted vegetables. It was a simple, delicious meal that Artie practically inhaled. 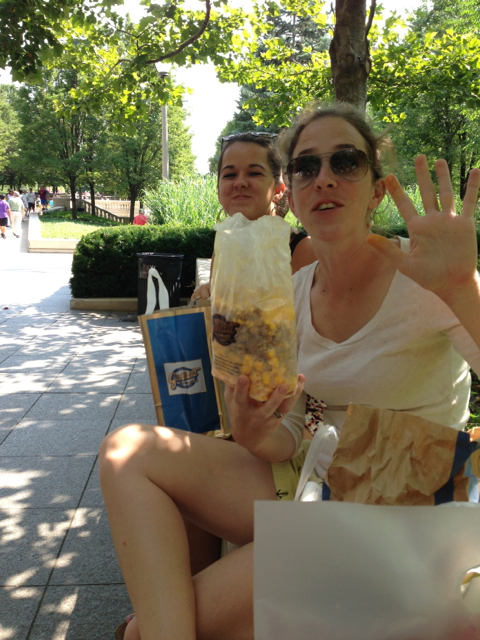 What can I say – after a day of walking up and down the beach, we were seriously hungry. The actual spaghetti was easy enough to prepare – we used jarred sauce (our favorite garlic spaghetti sauce) and basic spaghetti noodles (both from Trader Joe’s). I don’t know if it was something about this spaghetti or the fact that we were hungry from a day at the beach, but it tasted more delicious than normal. To prevent having to clean extra dirty dishes, we boiled the spaghetti noodles, drained them and returned them to the same pot, and then poured in the sauce. We complemented the spaghetti with roasted vegetables. One package of pre-washed/pre-chopped broccoli and half of a sliced red onion (left over from the black bean tacos the night before) tossed with olive oil, salt, and minced garlic, then roasted at 350 degrees for 20 minutes. Artie also made some garlic bread. He spread a few slices of whole wheat Italian bread (another Trader Joe’s find) with butter that had been mixed with minced garlic and then toasted the bread in a skillet over medium heat. This definitely isn’t the most gourmet meal we’ve ever made, but it was tasty and quick to prepare. In fact, the timing couldn’t have been better – while the pasta water came to a boil, I chopped the onion and broccoli and got them into the over. When I drained the pasta, I tossed the vegetables once. While the sauce heated up with the noodles and Artie made the garlic toast, the veggies finished and everything was ready to put on the plate at once. That almost never happens for me in the kitchen. We ate dinner on the deck while watching the sunset with a bottle of Newman’s Own Chardonnay. Perfection. 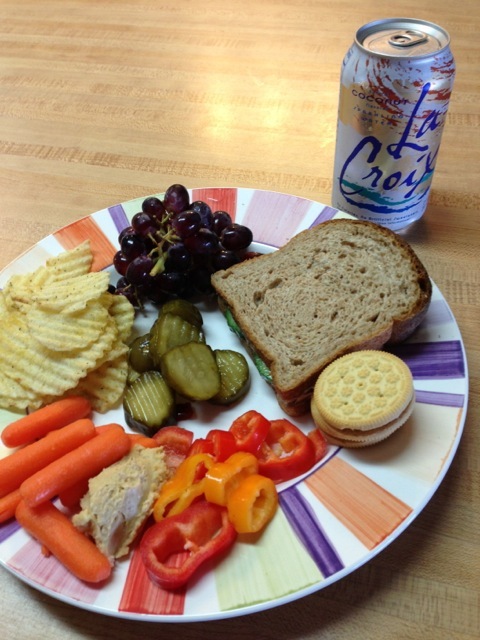 While we were on vacation at Little Gasparilla, we tried for simple, healthy food that was easy to prepare (no special kitchen gadgets required) and easy to clean up (so we could get back to the sun and sand). 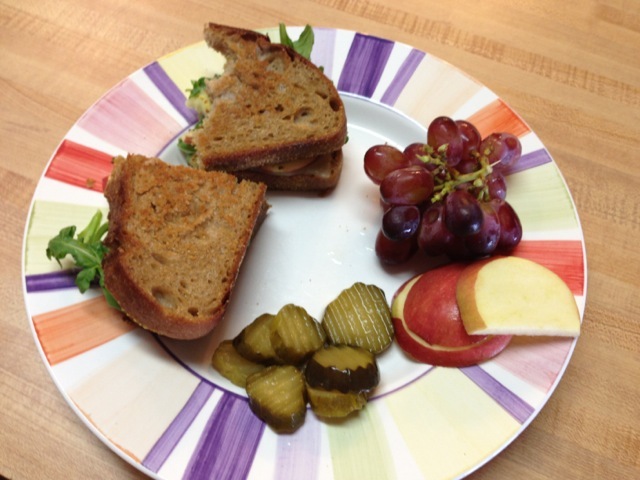 Breakfasts were sunflower seed butter and jelly sandwiches, English muffins with butter and jelly, bananas with sunflower seed butter, or yogurt with blueberries. 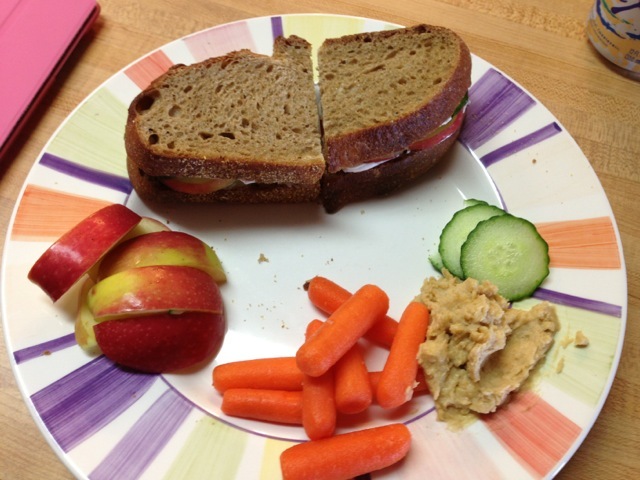 What are some of your favorite go-to luches and dinners when you are preparing simple, healthy meals? 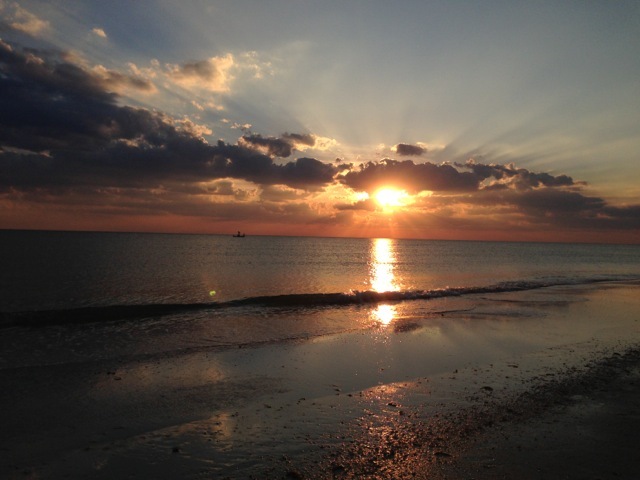 Last week, Artie and I spent five glorious days at my family’s beach house on Little Gasparilla Island. LGI is unique because you can only reach the island by boat and you have to bring your own drinking water and shower in rain water that is collected in tanks. It sounds rustic, but it is wonderful. 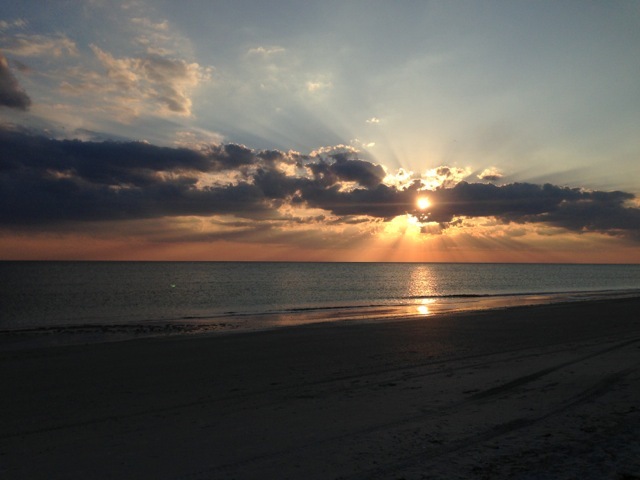 The beach is only a few steps from the front door and the sunsets from the deck can’t be beat. 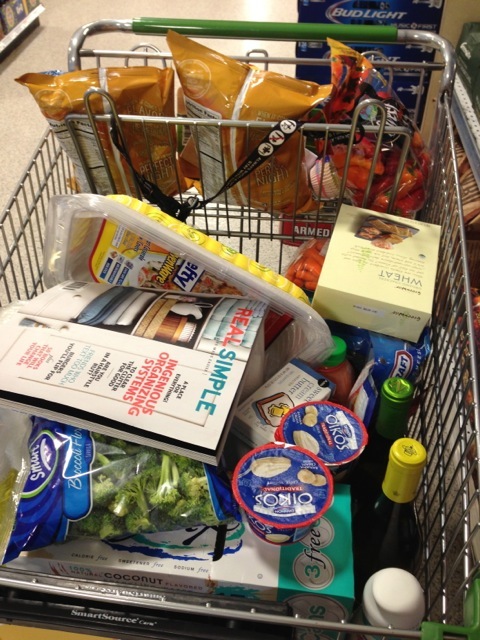 When traveling to an island with no stores for a week, it is important to make a detailed shopping list because forgetting something means either 1) go without it or 2) take a 15 minute boat ride to mainland, give up your parking space in the marina, and drive to an (expensive) Publix down the road. We usually go with option one because option two is a pain. 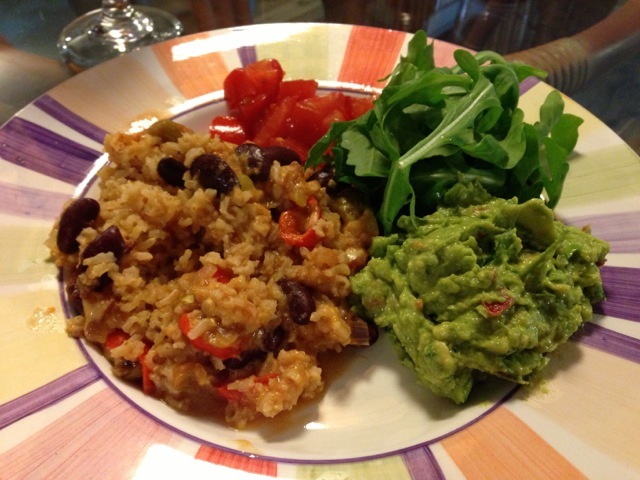 The black bean taco recipe is one of our new favorites (a Pinterest find) and the rice and bean casserole has been on my list of recipes to try. As you can see from the menu, we ended up having an accidentally vegetarian vacation. I don’t like cooking (or eating) meat very much and Artie is good enough to play along. Overall, it was a delicious menu that didn’t take a lot of time to cook or clean up and satisfied our hunger after long days walking on the beach and swimming in the ocean (I know, it sounds so rough, right?). My family liked the food (even if they did supplement the meals with meat…) and we didn’t end up with lots of groceries left over. I’ll be back this week with more details! When I lived in Panama City, Florida, I used to go snorkeling in the bay for scallops. 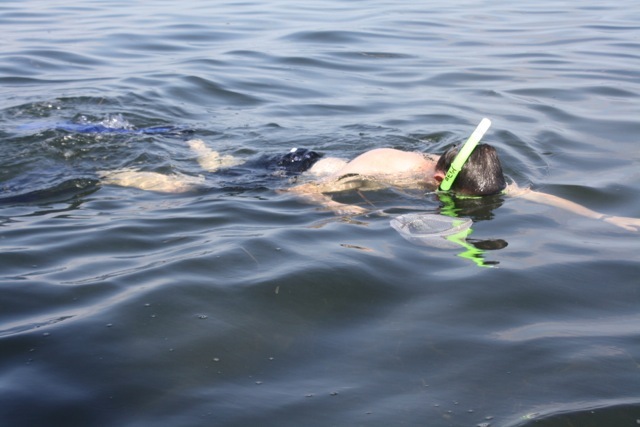 Since moving away from the beach, I had not been scalloping again until this past summer when Jill, Jill’s sister, and I met up with my parents in Port St. Joe for a day of snorkeling and scalloping. After snorkeling around at a couple of different sites without finding scallops, we finally reached a part of the bay full of them. 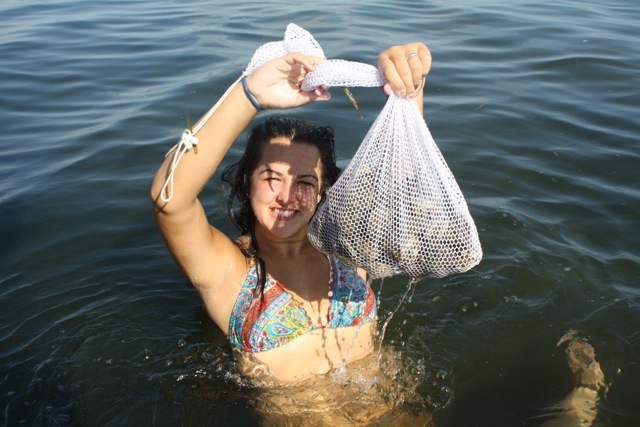 We swam, collected scallops, and generally had a great time. Back at home, I shelled and cleaned the scallops. Wanting to share the bounty of scallops, I invited several friends over for a scallop dinner. 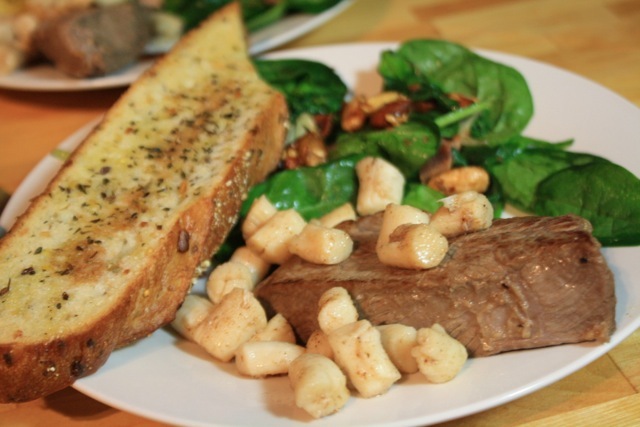 The menu included scallops, steak, crispy bread, and a warm spinach salad. For the bread, I sliced a multigrain baguette lengthwise, drizzled the slices with olive oil, and topped the slices with salt, pepper, garlic, dried basil, and dried oregano. I then baked the slices at 350 degrees for about 10 minutes. I marinated the steak in a mixture of bourbon, soy sauce, olive oil, lemon juice, and garlic. After marinating, I cooked the steak in a skillet to medium doneness. In another skillet, I cooked several slices of bacon until crispy, reserving the bacon. I scored the scallops with a sharp knife and sprinkled the scallops with a little salt, pepper, and Chinese five spice power. I then cooked the scallops in the bacon grease until slightly firm. For the spinach salad, I heated up a drizzle of olive oil and tossed in several handfuls of spinach, turning until slightly wilted. After seasoning lightly with salt and pepper, I removed the spinach, added crumbled bacon, and mixed in some soledad almonds. As much I can, I like to have a connection between the food I eat and the place my food is grown or caught. Swimming in the ocean and catching deliciously sweet bay scallops by hand provides a deep connection to the food. With a meal that balanced land and sea with the crunch of crispy bread and the softness of the warm spinach salad, I am anxiously waiting for scallop season to open up again.